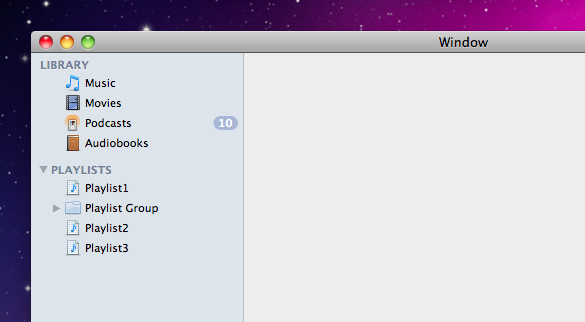 Source Lists feature in many Mac OS X applications. From iTunes to iCal to Versions, they are a great navigation control. But for us Cocoa developers, they aren’t that easy to implement. You can easily create an NSOutlineView and set its highlight mode to “Source List” but none of the other Source List features come built in out of the box, such as the ability to display badges or icons for items. Automatic Group highlighting of top-level items – the text for Group items appears in a dark blue colour and is normally displayed as capitalized. Support for Badges – these are dark blue capsules displayed to the right of certain items that display a number. The option to display an Icon for each row – a small image that provides extra visual information for each row. Right-clicking support to display context menus. More information about PXSourceList is available from the project page. There is also documentation available – a link to this can be found on the downloads page for the project on GitHub. If you have any other questions then feel free to get in touch and I’ll be happy to help. Anyway thank you very much for this. declared on NSOutlineView’s NSOutlineViewDataSource protocol. It’s a method which notifies the data source that an item has been edited and it should update its model to reflect these changes. ouu…thank you very much for your help ^^ :). It worked. I have a question. You can detect that the delete key is pressed on a row. ( in the method “sourceListDeleteKeyPressedOnRows”). Could you make me an example how to remove the row on that the delete key was pressed? I’m not really familiar with Mac development (and your PXSourceList..but soon) only with iPhone development. @Tom: You want to update your model first, to remove the item(s) to be deleted. Then call -reloadData on the Source List to update the display; you may also want to change the selection by calling -selectRowIndexes:byExtendingSelection: to either remove the selection or alter it. Yes but how can I delete a item at a specific row? I don’t really know how to delete an item itself. @Tom: That entirely depends on how your data model is constructed. The aim of the notification is to allow you to delete an item (if it can be deleted). This is done by removing it from your data model, and then calling -reloadData on the Source List to tell it that your data has changed. You can work out which row(s) are currently selected from the Notification object’s userInfo dictionary, which has the selected indexes stored under the key @”rows”, and this can be converted to the item to be deleted by calling -itemForRow: on the Source List. Thank you for this control, it’s awesome. The only problem I have is that the – (void)sourceList:setObjectValue:forItem: method of my data source isn’t being called. As far as I can tell outlineView:setObjectValue:forItem: in PXSourceList isn’t being called either. Is there anything I need to do other than set the data source and delegate? I’m using the SourceListItem code in my data source. Me again, I fixed it! i see support on the code, i am missing something? you have to set the autosave as well for this to kick in. I have used your control and its awesome. Now I have a small problem, I want to create an application like iTunes, which has dragabble nsoutlineview. Can we do this here. Any help would be greatly appreciable. I was pulling my hair out trying to get icons into NSOutlineView.